Social Media Policies can vary greatly in form and shape comparatively. Fundamentally as the business environment changes, the majority of businesses are finding they need to make a choice, either to close themselves off and wall out social media or embrace the trends of humanising their brand and encouraging transparency.. Regardless of the choice made, the increasing embedness + integration of social media in the mainstream means no business is really devoid of its influence. In order to ensure they can stay in operation, orgs need to discuss + plan thier involvement, approach + strategy with social media. If you choice to avoid it, implementing Social Media Policy will ensure you have established boundaries + have clear expectations of your staff. Also acting as a safe guard, Social Media Policies in such cases, will ensure such standards can be enforced. If you chose to involve your business in the social media world, Social Media Policies are also critically important but for entirely different reasons. Social media sucess in business requires leaders to adjust they're expectations + approach as much as it does those consuming it. 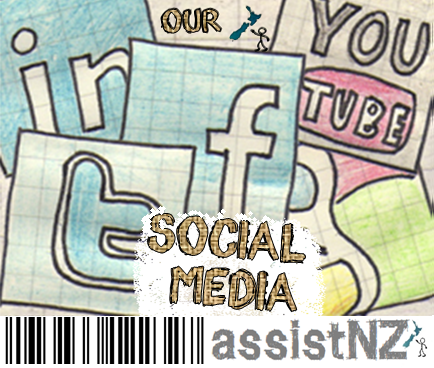 AssistNZ can help your business plan, protect and police social media for you, whatever that may entail. If your interested also, please let us know. I noticed your ad on trademe for Part time, Contract/T emp assistance with site clean-up and construction help in Christchurch following the recent earth quake, I am actually not local, I live in Auckland. But I had a bit of an idea which I thought maybe of benefit to you guys as well as some of my friends whom also based in Auckland but are currently unemployed. As well as of course the Canteburians whom are currently facing a time of great need. I am trying to organise accommodation and transportation for myself and at least two others and am considering flying down as soon as tomorrow evening if I need to. What kind of work do you need to fill? Personally I have no professional experience in building or other trade work but I have fixed up my own property and done a fair share of DIY. My partner, whom would also be coming down comes from a legal and chemistry experience and we together have a consultancy business dealing with social media in business, but as a recent start-up our client list is currently limited and we are currently in a position after just returning from Australia where we have a few weeks which are relatively flexible in terms of other commitments and felt this could prove to be an opportunity which we could innovatively use our own networks to assist others. If you would be able to give me some idea of where about most of your work would be located, how many people you are potentially seeking and what kind of rates you have budgeted for these kind of roles. What I am considering is that we would be able to fly down over the next few days and provided we are able to find adequate accommodation and transportation (we have overseas contacts with vacant property in Timaru which potentially require checking out after the quake also etc) and myself, my partner and one of our associates could come down and work with you guys before the weekend even. Given the need for additional expenses in order to sort out our accommodation, transport etc, I think the wages provided by doing work with your projects would allow us to sort these out for ourselves and potentially sort out accommodation and transport for further people to come down and bring technical and required skills (such as the many trades people, builders, plumbers, electricians etc whom are friends of ours) with paid work from you, minus a minimal accommodation/transport etc expenses charge from us. Would appreciate your consideration and contact. If only for 3 of us to come down and help out.